Magpie (Pica pica). Taken at Abingdon, Oxon., on August 31st 2008. Taken at Abingdon, Oxon., on August 31st 2008. 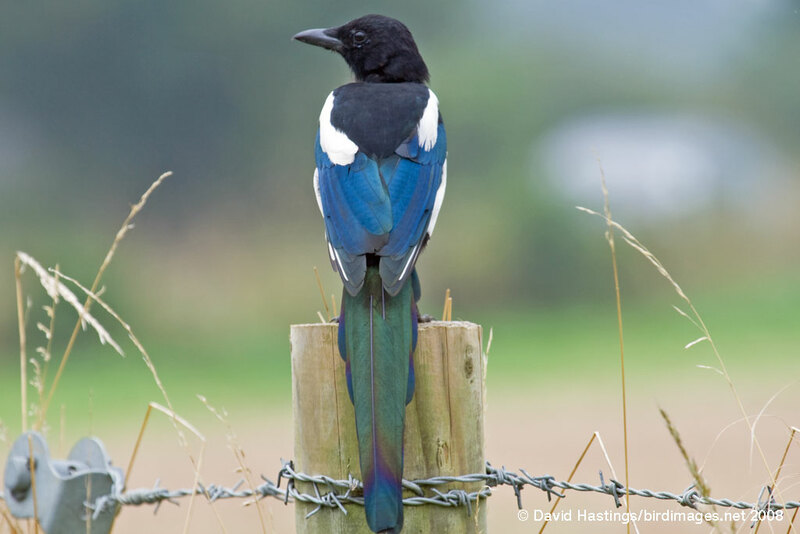 The Magpie looks like a black-and-white bird from a distance, but when seen close-up the its black plumage takes on an altogether more colourful hue with a purplish-blue iridescent sheen to the wing feathers, and a green gloss to the tail. It is found over most of the British Isles, except northern Scotland. It can be found in a range of habitats from city centres to lowland farmland to upland moors. Non-breeding birds gather together in flocks. There are about 600000 breeding territories in the UK.